For anyone who has small or major life goals, whether they’re related to financial freedom, travel, business, or anything at all…I think it’s important to write it all out. And better yet, publish for others to read. This will not only help you get organized and set priorities, but it’ll also allow others to be inspired by what you do AND hold you accountable. While reading some amazing life/bucket lists from inspiring folks like Coby McKibben and Maggie Mason I kept finding more and more lists from others. Each one unique and incredible in their own ways. But nothing hit me harder than stumbling upon Candy Chang’s Before I Die… project. The pictures on this page are from her website. It’s amazing! It seriously made me cry and caused me to fully re-think my list. 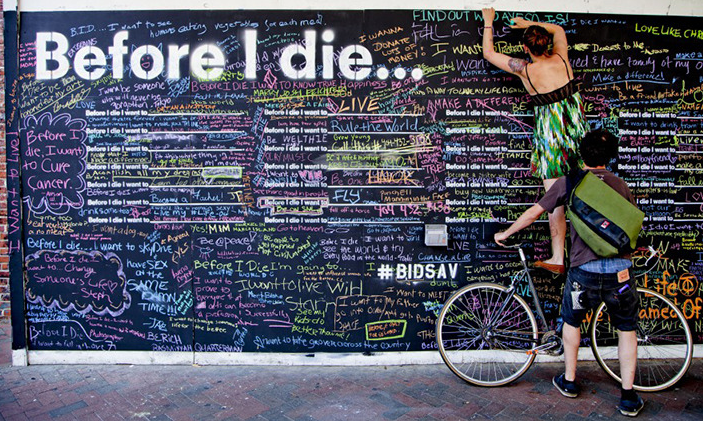 Going from “bucket list” to “before I die” gave new meaning to what writing all of this down, and sharing it with you, means to me. Thank you, Candy! The ever inspiring folks of VegNews Magazine created an awesome 99 [vegan] Things you Must Do as part of their recommended vegan bucket list. I thought it would be fun to incorporate this list into my trip. Let’s see if I can accomplish at least half (if not all!) of these 99 things within the next 365 days! As I complete each one I’ll cross it off of the list and write a blog post about my experience with that adventure. Some of items I’ve already accomplished (before my road trip started). Rub a pig’s belly at Los Angeles’ Gentle Barn or New York’s Woodstock Farm Animal Sanctuary. Take a vegan tour of Los Angeles stopping at Eko Zone, Pure Luck, Shojin, Real Food Daily,Native Foods Café, Veggie Grill, to start. Grab the ‘D’s BBQ Joint wrap at Seattle’s Hillside Quickie (CLOSED) and have a picnic at nearby Volunteer Park.